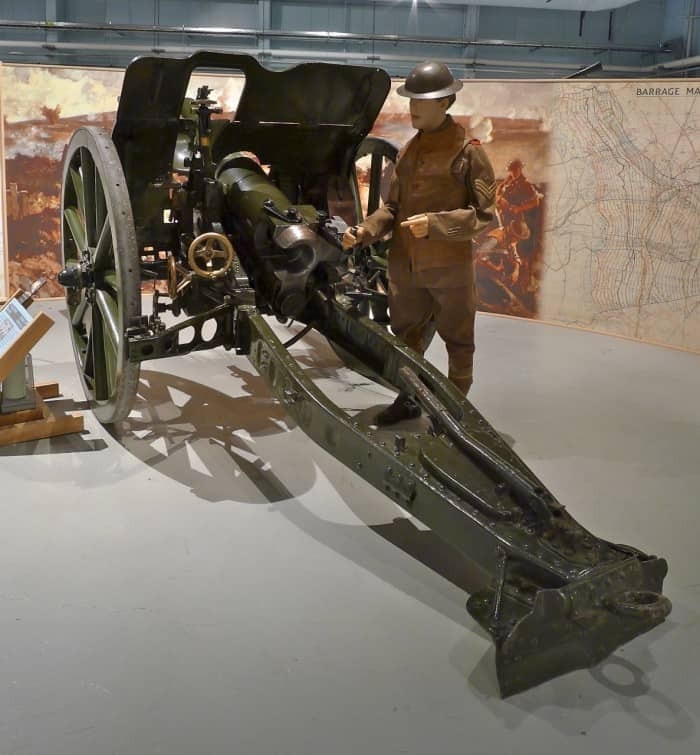 The 4.5″ Quick Firing Howitzer was used in action by Canadian Gunners 1914-1918 and remained in service for training in Canada into the Second World War. The Howitzer is a concept dating back to the 1700’s. It was designed to lob shells in a high arc allowing it to fire over the walls of fortifications and into trenches. In this way Howitzers are similar to mortars, but are more powerful, giving them a longer range. The 4.5″ Howitzer was in Canadian service 1911-1941. Quick Firing indicates that the propellant gases are sealed in the breech by a brass cartridge, not the breechblock. This gun appeared in the movie “Passchendaele”. Detachment: gun and limber, two ammunition wagons, 10 gunners, 9 drivers and 20 horses. Later gun and limber, towing vehicle and 7 gunners.